I have a huge love for color so when you look in my closet, neutrals can be kind of hard to find, especially when it comes to bags. I like my bags and shoes to be bright and cheery! Well actually everything I own tends to be that way! Especially this time of year when winter clothes tend to be more on the neutral side, which I find a bit depressing, but I must admit my winter wardrobe outfits are a lot easier to pick out than my summer outfits, thanks to the lack of color. 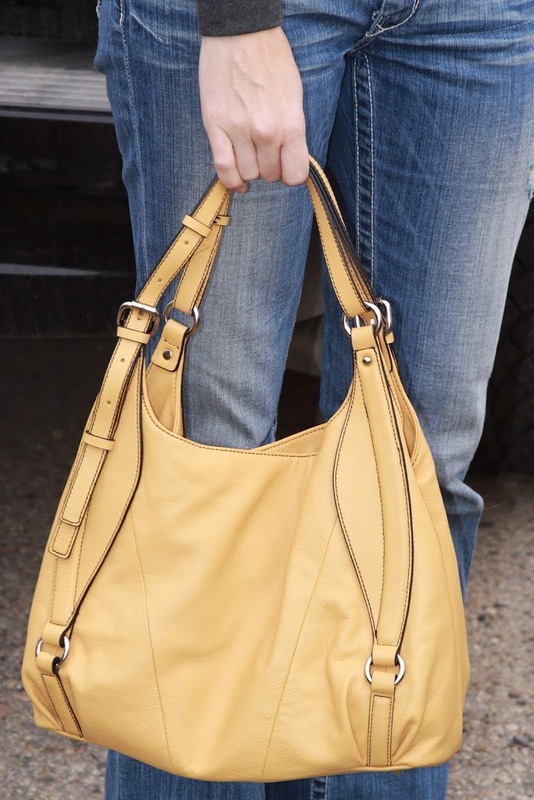 I was beyond excited to get my hands on this gorgeous Mustard Soft Leather Buckle Strap Satchel from Barr + Barr Handbags! This bag is absolutely gorgeous and the perfect size for me and all my stuff! I like a bigger sized bag because I tend to pack rat things around with me all day, at least that’s what my husband tells me. This gorgeous leather satchel is super soft and flexible. The straps are so comfortable even when full of heavy things. I also love the cute liner and the many zipped pockets on the inside, which is the only way I can hope to have a chance of staying organized! But ask me where my keys are and I will not be able to find them! That’s just me, not the bag! I highly recommend Barr + Barr Bags if you are in the market for a luxurious feeling/looking bag you won’t have to spend a fortune on. And for you neutral lovers, don’t worry, they have plenty of browns and whites, including a pretty ice shade in this style! You can also of course, find lots of beautiful bright colored bags and fun prints from Barr + Barr as well! Check out Barrandbarhandbags.com today and find the perfect bag for you! Be sure to follow me on Tumblr to stay updated on all things fashion and beauty!